5) “The Dreams of General Grievous” – Despite the seeming failures (or, at least, non-successes) of the battles in which General Grievous has been, which makes him seem an unfit leader, this particular segment provides not only a sense of General Grievous’ fighting days behind him, but also about his disappoint with his current troops. In his reflections, he greatly enjoys and desires being involved in battle/war , and has had tremendous success in doing so: “I have toppled nations. I have slain kings. I have murdered legends.” However, he notes, “There are but dreams now…dreams of a past that continue to fade. Of late, I have tasted failure.” The problem, it seems, is that “These troops I command…they are not the warriors of my past. 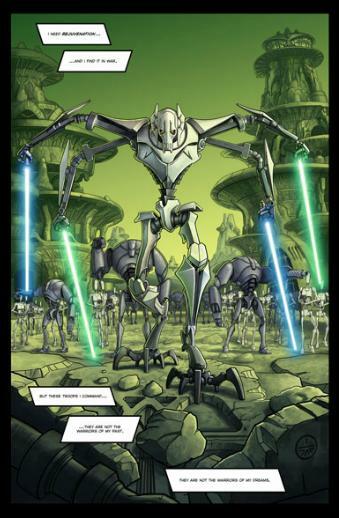 They are not the warriors of my dreams.” We also see at the end that Count Dooku is trying to reach him. 4) “Invitation Only” – We get a sense of how awesome Cad Bane is before he is introduced on-screen. We also see Master Plo-Koon at the end volunteering to lead sweeps in the region to look out for the Malevolence. 2) “Cold Snap” – Provides a wonderful background for the sense of what was going on the base on Orto Plutonia, as the attacks on the clones were taking place and the clones’ being baffled by what was occurring. 1) “Prelude” – Introduces us to some of the clone troopers in the episode and their desire to see some action, however it also sets up two important other pieces to the story: 1) we understand why there is a neutral planet established for the meeting between King Katuunko and Yoda and 2) we understand how the Separatists know of the meeting’s location, such that Asajj Ventress is able to get there. 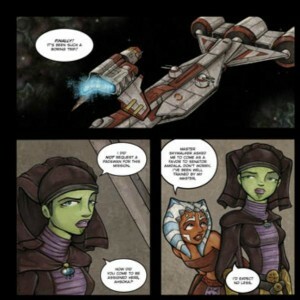 – “Transfer” – We understand how/why Ahsoka is accompanying Master Luminara Unduli and not Anakin Skywalker. 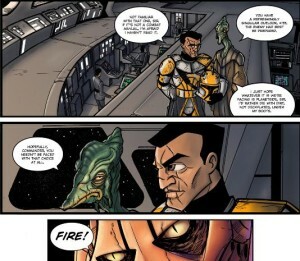 -“Bait” – Gives us the picture of how and why Anakin Skywalker is captured by the Separatists (despite him bringing a lightsaber to the ship in the webcomic and not having one in the episode). -“Neighbors” – Helps provide a better sense of the effects of colonization – did they settle an uninhabited planet? This shows that they did not and faced hostility from the natives…. -“The Valley” – We see what’s going on a little bit as far as a potential issue is coming up and being reported to the Queen. 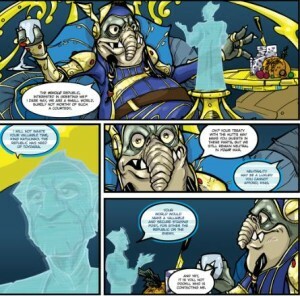 Also, we are introduced to a shaak for the first time (prior to the episode). Lastly, we see some conflict between the humanoid Nabooans and the shaak. -“Agenda” – Although not so important as the episode which follows (“Destroy Malevolence”), it does give us a sense of how surprised Padme is to find out about the plight of the citizens of Rodia, which provides a little bit of important background to a different episode (“Bombad Jedi”). -“The Fall of Falleen” & “Head Games” – While there is very little importance to these segments within the larger story, it does provide some entertaining fighting.